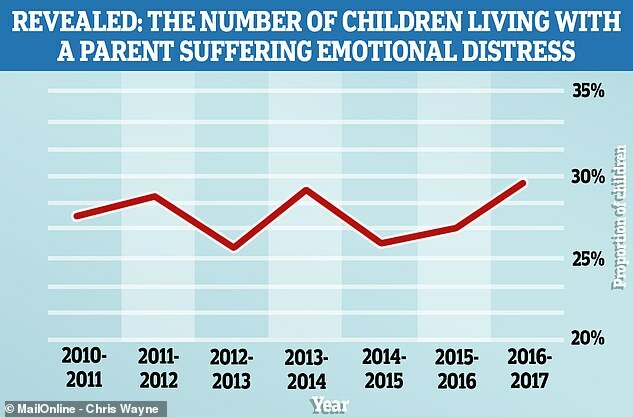 Almost one in three children (29 per cent) are living with a parent with emotional distress – the highest proportion on record, data show. This is up from the 27.3 per cent recorded by Public Health England in 2010, when the set of statistics began. The figures show a strong link between unemployment and the likelihood of living in a home with a distressed parent. Emotional distress is a snapshot that indicates mental health problems, such as anxiety or depression. Growing up around parents in this situation can be potentially dangerous for the child’s mental health later in life, experts say. Nine per cent of those born in the early 1990s had suffered depression by 14, against 15 per cent for those born at the Millennium, research has found. Rates of self-harm went up from 12 to 14 per cent between the two groups. Teenagers today drink less, take fewer drugs, and are less likely to be vandals or violent than their elders of just a decade before. The shift in the behaviour between two generations of 14-year-olds just ten years apart may illustrate the impact of social media. The new evidence compared the behaviour of 5,600 children born in the Bristol area in 1991 and 1992, and the contrasting lives of 11,000 children born across the country in 2000 and 2001. A Public Health England spokesperson said: ‘Parental emotional distress can lead to mental health problems including anxiety or depression. Previous research shows employed adults are less likely to have a common mental health problem, such as depression or anxiety, than those who are unemployed. While around 14 per cent of adults in full-time employment had a common mental health problem, 29 per cent for those who were unemployed do, according to figures from the Adult Psychiatric Morbidity Survey. Dr Bernadka Dubicka, chairwoman of the child and adolescent faculty at the Royal College of Psychiatrists, said: ‘Mental distress among adults is clearly on the rise and we cannot underestimate the impact this has on the children who are close to them. ‘Not every adult with emotional distress will have a mental health disorder, but many will. If we can treat their illness early, this could have significant positive effects on the wellbeing of their children. Children of parents with a severe mental illness may experience similar issues because their inherited genes make them more vulnerable to mental ill health. But it could also be because of their situation and the environment in which they are growing up, charities say. Tom Madders, campaigns director at youth mental health charity YoungMinds, said: ‘The circumstances that young people grow up in can have a big impact on their mental health. ‘As a society, we need to get much better at identifying when seemingly “difficult” behaviour in young people may be a reaction to difficult experiences.